Our moisturizing lip balms are made in small batches from organic and local ingredients as much as possible. These lip balms go on easily and have a long lasting moisturizing effect. We have the lip balms available in the conventional plastic lip tubes and the little larger .5 oz tins and cardboard push up tubes which are made from recycled materials and are biodegradable. 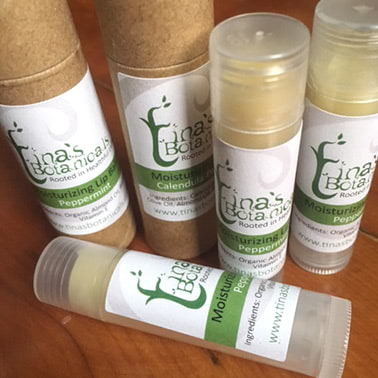 This moisturizing lip balm is made from organic and local ingredients as much as possible. This lip balm goes on easily and has a long lasting moisturizing effect. We have the lip balms available in the conventional plastic lip tubes and the little larger cardboard push up tubes which are made from recycled materials and are biodegradable. This moisturizing lip balm is made from organic and locally sourced ingredients as much as possible. This lip balm is refreshing, goes on easily and has a long lasting moisturizing effect. We have the lip balms available in the conventional plastic lip balm tubes and the little larger eco-friendly cardboard push up tubes which are made from recycled materials and are biodegradable. This moisturizing lip balm is made from organic and local ingredients as much as possible. This lip balm includes organic infused olive oil with locally grown Calendula flowers and locally sourced beeswax. It is very soothing, goes on easily and has a long lasting moisturizing effect. We have the lip balms available in the conventional plastic lip balm tubes and the little larger eco-friendly cardboard push up tubes which are made from recycled materials and are biodegradable. This moisturizing lip balm is made from organic and local ingredients as much as possible. This lip balm includes organic infused olive oil with locally grown Calendula flowers and locally sourced beeswax. The lip balm is very soothing, goes on easily and has a long lasting refreshing and moisturizing effect. We have the lip balms available in the conventional plastic lip balm tubes and the little larger eco-friendly cardboard push up tubes which are made from recycled materials and are biodegradable. This healing lip balm works wonders for the pain and inflammation of insect stings or cold sores. It is made with the soothing, antiseptic, healing qualities of locally grown or wildcrafted Comfrey leaf, Plantain leaf, Calendula flowers, Lemon Balm, and Cottonwood buds infused in organic olive oil with locally sourced beeswax.